In the mid-50s, a long-haired, barefoot young BU student-folksinger showed up at jazz coffeehouse Club 47 in Harvard Square. She got herself onstage that once and asked for another chance the following Sunday. 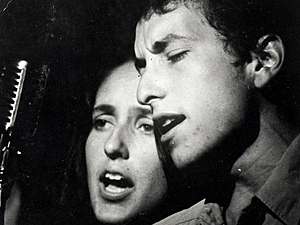 Bringing along a small crowd, Joan Baez convinced the club to give her a regular gig on Sunday afternoons. Bob Dylan never actually got himself booked for a show at Club 47. He talked himself onstage between acts so he could say he had performed at the venue that had become a rite of passage in the folk world. Club 47 moved in 1963 from Mt. Auburn Street to Palmer Street. Closed in 1968, it reopened as a card shop, but folk musicians kept showing up and asking to play gigs so the owners eventually gave in. They converted the place back to a music venue that they called Club Passim. Today, Club Passim shares its basement quarters with pizza restaurant Veggie Planet, which offers a delicious Blonde on Blonde white pizza. This entry was posted in Cambridge, Music&Art and tagged Bob Dylan, Club 47, Club Passim, Folk, Harvard Square, Joan Baez. Bookmark the permalink.